On my way to school this morning I was listening to Stitcher – a podcast app – when the latest version of Freakonomics played. It was such a powerful episode and brought tears to my eyes several times. Why? Let me sum up: a man living in New England voluntarily donated a kidney, that went to a mom in Colorado. Her dad donated his kidney as well and the this created a three kidney donation chain. Why was this important? Because there are over 100,000 people who need a kidney and waiting on a donor list could last as long as five years. During that time waiting, people may not survive. One person who freely donates a kidney can create a chain that goes 48 people deep. Talk about life changing. Kidney donation is important. That donation is not successful without doctors, nurses, pharmacists, blood donors, kidney donors, case workers, insurance…So many things are required to make transplants possible. Almost all of them require some kind of education. A Teacher was involved somewhere along the way. What if we were able to view education through a lens that allowed us to see all of the students, instead of just those in my building or community? What if were were able to help the poorest and neediest students by asking them what they truly needed? What if we could view education as a place where the collective good was more important than…anything else? What can we do to create a chain where education is impacted in a way that is so profound, we feel silly for not doing it before? I know that several school districts have set up foundations that help teachers in that district with some funding. This helps – but the competition to earn one of these rewards is difficult. DonorsChoose has provided some relief for teachers willing to hustle and work to promote their needs. Is there more? Is there a better chain waiting to be created and used? Allow our schools to have some freedoms – can we think outside the box? In the world of kidney donation, for the longest time, someone had to die to provide a kidney to a person in need. Then someone figured out that relatives may be a good match and this improved the process. Now there is an organization that wants to help think outside the box and help connect those in need a kidney with those willing to give one. Lets think outside the box for education – what can we do differently? What really needs to go? What regulations are holding schools back? How can funding be adjusted and updated? What are other places doing so well that we should just copy them? It may surprise you that I have some thoughts here…. Reorganize the school day – move toward something more open. Work with parents who work, create a school day for that schedule. Include more play time (recess) for the younger students. There has been some positive real life results from this in Texas. Redo our tax structure and funding formula – put the emphasis on equity. This doesn’t mean everything has to be the same, but inner city students deserver the same opportunities as those in the suburbs as for those in rural districts. This does not always happen. Do you really want to improve education – then look at places that do it well: Massachusetts and Finland are doing great things. What can we borrow from them and put into our systems? 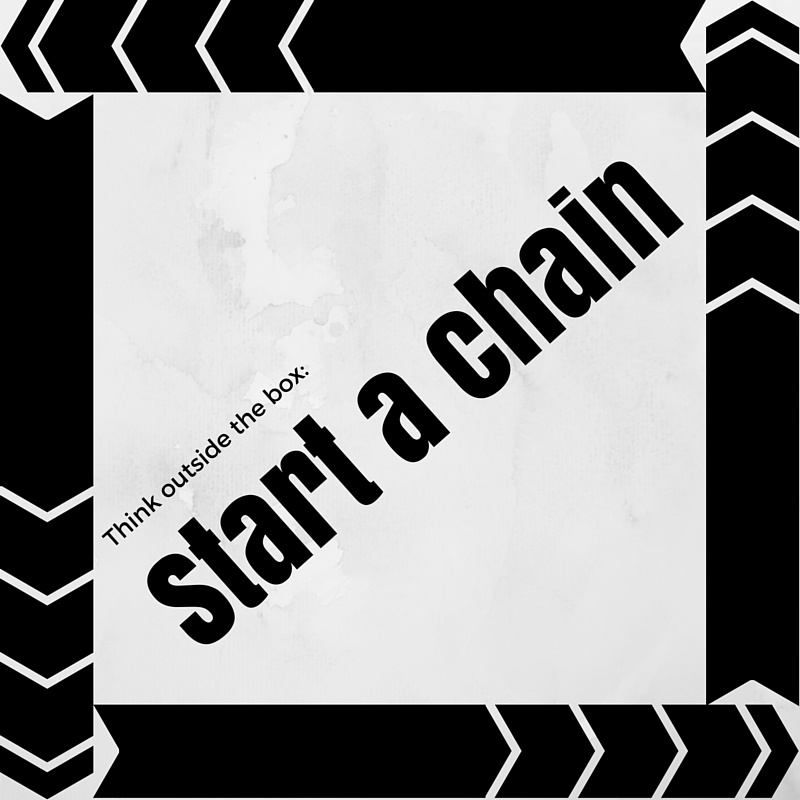 What chain can be started that makes a positive difference?